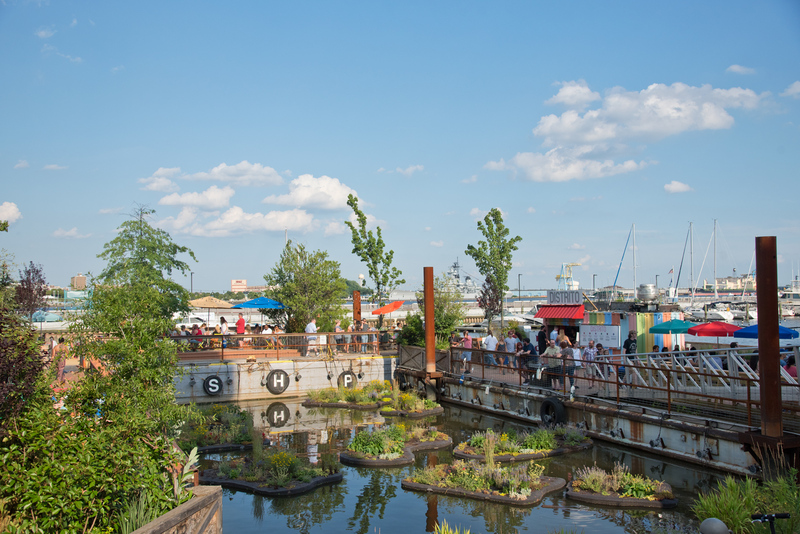 Where to get your loungin’ on: a guide to Philly’s best city parks! Fact: back in 1683, when William Penn was mapping out the design of Philadelphia, his goal was to create a “Green Country Town” that would attract settlers from across the Atlantic. The basis of his design? Five public squares across the city – one in each quadrant of [what was then] the main part of the city, and one right in the center. Those integral public spaces are now Rittenhouse, Logan, Washington, and Franklin Squares, and Dilworth Park – just some among many of our favorite parks in the city for relaxing, picnicking, people watching, and reading on a park bench this summer. Rittenhouse Square: there’s always something to do in Rittenhouse Square, whether it’s watching street performers, shopping at a craft fair, visiting the farmer’s market, or simply reading a book on a park bench while people watching. Pack a picnic, grab a blanket, and take in the sights and sounds of this beautiful park all summer long. Logan Square: stroll along the Ben Franklin Parkway to Logan Square – you’ll spot the impressive Swann Memorial Fountain sculpture from a distance. With the Free Library a block away, it’s impossible not to want to grab a book and spend the day reading in the park, with a nice mist from the fountain cooling you off on a hot day. Check out Sister Cities Park, for more greenspace, fountains and a café, just across the street as well. Schuylkill Banks: Philly’s most popular biking, walking and running trail, a part of the larger Schuylkill River Trail and the Circuit Trails – stretching from the Art Museum down to South Street – the Banks hosts movie nights in the summer as well as kayak and riverboat tours. Check out the boardwalk over the river and the neighborhood dog park nearby 25th and Spruce. Washington Square: smack dab in the middle of Center City and Old City, Washington Square’s tree-lined park (a.k.a., plenty of shaded areas!) is right around the corner from historic Independence Hall, and makes for the perfect resting spot in between a day of exploring all over Philly. See if you can find the tree in the park that has taken a trip to the moon. Yes, seriously! 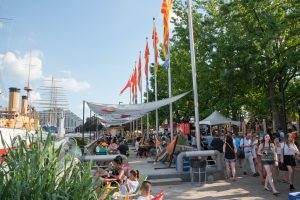 Spruce Street Harbor Park: the Delaware River deserves just as much credit as it’s western neighbor, the Schuylkill, especially now that this park has become the go-to spot for daytime and nighttime activities, alike. With Philly’s top eateries like Hip City Veg, Chickie’s and Pete’s, Franklin Fountain and more setting up shop along the boardwalk, there’s always a reason to hang out here in the summer. Lounge in a hammock, sit above the river in a suspended net, or watch a live band on the weekend. Oh, and did we mention there’s an arcade AND giant Jenga? Wissahickon Valley Park: when you’re in the Wissahickon (or “the Wiss” as many call it), you’ll forget that there’s a bustling city just 4 miles away. With more than 50 miles of trails for every skill level, a wide gravel path called Forbidden Drive to bike or walk on, and scenic views along the creek, it’s easy to stay here for hours. The paths are mostly shaded, too, so it’s a perfect escape from the sunny city in the summer. Franklin Square: between miniature golf, snacks and burgers, a carousel, and year-round events at the park, the historical Franklin Square is the perfect respite from the busy city. It’s a few blocks north of Market Street, and super accessible by public transportation. Stay up to date on their website to find out about the current events happening there. Dilworth Park: the expansive park surrounding Philadelphia’s City Hall, Dilworth Park, just keeps getting better each year. There’s food at Dilworth Park Café and Air Grille, plenty of seating for lunch breaks and picnics, fountains, gardens, and even free fitness throughout the week. There’s also a subway station directly in the middle of the park, so getting there is a breeze! Clark Park: if you’re in the University City / West Philly area, or just want an excuse to take the Market-Frankford line to a park you’ve never visited before, make sure to visit Clark Park. There’s 9 acres of greenery (it’s huge!) filled with more than 300 trees, and there’s always an event going on – farmer’s markets, movies in the park, concerts, performances, and so much more. Learn more here! Fairmount Park: to classify this as just one “park” is slightly crazy, since the 9,200 acres of trails, bike paths, hills, and wooded areas make this one of the world’s largest municipal park systems. Bike, run, or walk along Kelly Drive for the best views of the Schuylkill, explore Fairmount Park’s historic mansions, or enjoy car-free streets on Martin Luther King Drive every weekend from April to October! 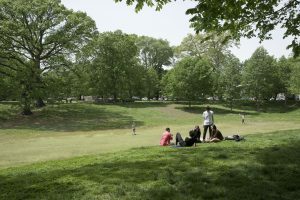 Belmont Plateau: here’s a fun fact to impress your friends – DJ Jazzy Jeff’s “Summertime” music video was filmed right here on the Plateau. When you’re looking at photos with the city skyline in the distance, it looks like it’s miles away, but this huge park on a hill, filled with picnic areas, endless fields, kite fliers, mountain bikers, and kids running around, is only four miles from Center City. You can take SEPTA right to the park (the 38 bus stop is a half-mile away)! The best thing about Philly is that for such a large city, everything is so close. These parks are easily accessible by public transportation, a pleasant bike ride along the river, or by car. We’re planning to visit all of them this summer (as should you!) – stay up to date on our adventures and follow us on Instagram!